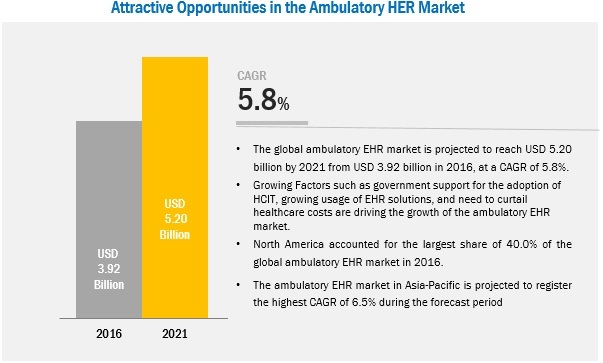 [160 Pages Report] The global ambulatory EHR market is expected to reach USD 5.20 billion by 2021 from USD 3.92 billion in 2016, at a CAGR of 5.8% during the forecast period. The major drivers for the market include government support for the adoption of HCIT, growing usage of EHR solutions, and the need to curtail healthcare costs. A combination of bottom-up and top-down approaches was used to calculate the market sizes and growth rates of the market and its subsegments. All percentage shares, splits, and breakdowns were determined using secondary sources and verified through primary sources. All possible parameters that affect the markets covered in this research study have been accounted for, viewed in extensive detail, verified through primary research, and analyzed to get the final quantitative and qualitative data. Primary interviews with key opinion leaders were also used to determine the percentage shares of each subsegment and the relative differences in growth rates. The report provides an overall understanding of the market. In this report, the market is segmented on the basis of application, delivery mode, practice size, end user, and region. On the basis of application, the market is segmented into practice management, patient management, e-prescribing, referral management, population health management, decision support, and health analytics. The practice management segment accounted for the largest share of the ambulatory EHR market in 2016. On the basis of delivery mode, the market is segmented into cloud-based solutions and on-premises solutions. On the basis of practice size, the market is categorized into large practices, small-to-medium practices, and solo practices. On the basis of end user, the market is divided into hospital-owned ambulatory centers and independent centers. On the basis of region, the market is segmented into North America, Europe, Asia-Pacific, and the Rest of the World (RoW). Geographic analysis reveals North America accounted for the largest share of the market in 2016, owing to the federal mandates, increasing geriatric population, collaboration between stakeholders, the need to curtail healthcare costs, payment deductions driving the adoption of EHR, conferences and workshops to raise awareness in the U.S., growing efforts to enhance healthcare delivery, and the adoption of digital recordkeeping in Canada. Some of the major players in the market include Cerner Corporation (U.S.), McKesson Corporation (U.S.), Allscripts Healthcare Solutions, Inc. (U.S.), Epic Systems Corporation (U.S.), eClinicalWorks (U.S.), athenahealth, Inc. (U.S.), NextGen Healthcare Information Systems, LLC (U.S.), Practice Fusion, Inc. (U.S.), eMDs, Inc. (U.S.), Amazing Charts, LLC (U.S.), GE Healthcare (U.S.), and Greenway Health, LLC (U.S.). On the basis of application, the global ambulatory EHR market has been segmented into practice management, patient management, e-prescribing, referral management, population health management, decision support, and health analytics. The practice management segment commanded the largest share of the global ambulatory EHR market in 2016. It is also projected to register the highest CAGR between 2016 and 2021. The significant share and high growth of this segment can primarily be attributed to the wide range of advantages associated with practice management solutions, including increased efficiency of day-to-day operations, enhanced value of services provided to patients, and improved adherence to compliance requirements. The global ambulatory EHR market is expected to reach USD 5.20 billion by 2021. The key factors propelling the growth of the global ambulatory EHR market are government support for the adoption of HCIT, growing usage of EHR solutions, and the need to curtail the healthcare costs. Heavy infrastructure investments and the high cost of deployment are the major restraints for the market. Presently, most healthcare providers have inadequate infrastructure (technology, data, and other resources) to manage complex healthcare cases. 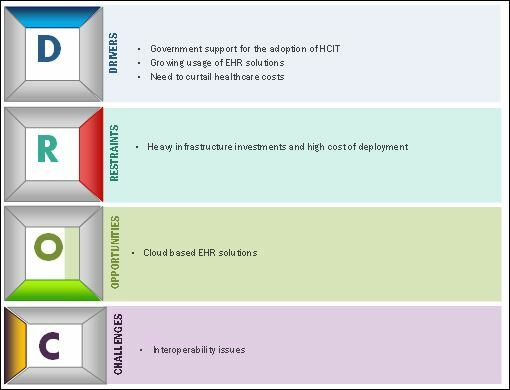 To implement ambulatory EHR solutions successfully, providers need to invest heavily in infrastructural development. In terms of IT infrastructure, investments are required for increasing data storage and processing capabilities. Finding the required investments to develop this infrastructure poses a serious challenge to the already-strained financial resources of healthcare providers. Additional investments would also be required to maintain this infrastructure. Currently, ambulatory EHR solutions are relatively high-priced software solutions. The maintenance and software update costs of these systems may sometimes be more than the actual price of the software. Support and maintenance services, which include software upgrades as per changing user requirements, represent a recurring expenditure that may amount to almost 30% of the total cost of ownership. Moreover, the lack of internal IT expertise in the healthcare industry necessitates training for end users in order to maximize the efficiency of various HCIT solutions, thereby adding to the cost of ownership of these systems. However, cloud-based EHR solutions are likely to offer lucrative growth opportunities for players in the ambulatory EHR market. Advantages associated with cloud-based solutions, which include flexibility and cost reduction in healthcare delivery are driving the cloud-based segment. Cloud-based solutions are based on SaaS (Software-as-a-Solution), which utilizes a group of servers to spread data processing tasks across healthcare organizations. This process requires a shared IT infrastructure, which contains a large pool of data that is integrated from disparate locations. A cloud-based solution can be sold on demand, is flexible, and fully managed by the provider; this differentiates it from traditional methods of delivery. Cloud-based ambulatory EHR solutions are likely to witness high adoption in the coming years owing to factors such as low cost of installation and maintenance, unlimited storage of information & easy access to the information at any place, and reduced spam and web threats. However, challenges such as shortage of trained staff, and ensuring confidentiality of medical records are expected to limit their adoption. Decision makers in healthcare organizations prefer to maintain access to on-premise solutions as they offer enhanced control, safety of inventory data, and cost benefits. The on-premise delivery mode not only allows end users to use solutions from multiple vendors but also reduces the risk of data breaches. Moreover, it allows the buyer to decide when to implement a software upgrade, ensuring time to test the software and train employees on new features. Another benefit of this model, specifically for organizations migrating or upgrading from one system to another, is its ability to reuse existing servers and storage hardware. Reusing hardware significantly reduces costs, particularly for smaller organizations that distribute these costs of server hardware over a relatively small number of users. However, longer implementation process, payments associated with hardware and IT costs, and issues regarding software updates are some of the factors that are encouraging the physicians to adopt cloud-based ambulatory EHR solutions. Expansion initiatives by hospitals (allowing them to establish ambulatory care centers and necessitating the adoption of solutions for streamlining workflow) and benefits of EHR solutions, such as operational savings and enabling patient involvement in medical decisions are driving the growth of the hospital-owned ambulatory centers segment. These centers can either be physically separate centers from hospitals or on-campus. The growth of this segment is attributed to expansion initiatives by hospitals (allowing them to establish ambulatory care centers and necessitating the adoption of solutions for streamlining workflow). In addition, the benefits of EHR solutions, such as operational savings and enabling patient involvement in medical decisions, have also driven their adoption among these end users. While the implementation of ambulatory EHR requires significant capital investment, hospitals can afford such investments; this accounts for their high market share. Moreover, the growing need to improve the profitability of healthcare operations and ensure cost-containment by preventing unnecessary healthcare spending, along with government initiatives to improve the quality of care and payment deduction for eligible professionals who are not meaningful users of Certified EHR, are driving the adoption of ambulatory EHR solutions among hospitals. Independent centers are solely owned by physicians and can be an extension of the physician’s office. Also known as freestanding ambulatory centers, they can be single-specialty or multi-specialty. Physicians have adopted ambulatory EHR in order to lower healthcare costs, and involve patients in healthcare decision. Furthermore, federal efforts to increase the adoption of EHRs have accelerated in recent years; this is driving the adoption of ambulatory EHR among physicians. However, the high cost of software and lack of health IT literacy among physicians are the restraining factors for this market. What do ASC leaders need in an EHR? How is that different from what hospitals and physician practices need in an EHR?? What problems with EHR integration arise when ASCs merge with hospitals? HIPAA requirements have recently changed as a result of electronic records. What do ASCs need to know to stay compliant? 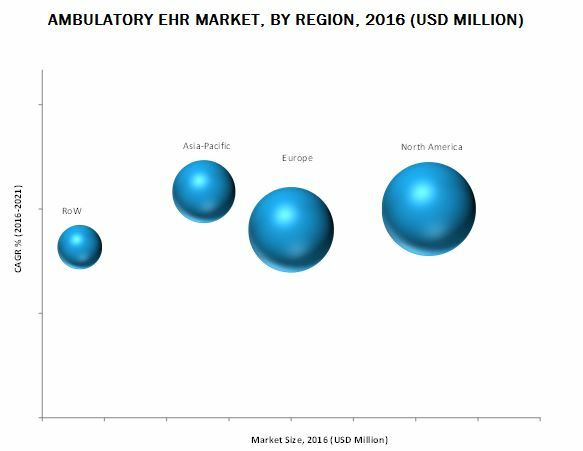 The global ambulatory EHR market is expected to reach USD 5.20 billion by 2021 from USD 3.92 billion in 2016, at a CAGR of 5.8%. The major drivers for the market include government support for the adoption of HCIT, growing usage of EHR solutions, and the need to curtail the healthcare costs. On the other hand, heavy infrastructure investments and the high cost of deployment are limiting the growth of the global ambulatory EHR market to a certain extent. The market is segmented on the basis of application, delivery mode, practice size, end user, and region. The application segment includes practice management, patient management, e-prescribing, referral management, population health management, decision support, and health analytics. In 2016, the practice management segment commanded the largest share of the global ambulatory EHR market in 2016. There are a wide range of advantages associated with practice management solutions, including increased efficiency of day-to-day operations, enhanced value of services provided to patients, and improved adherence to compliance requirements. The delivery mode segment of the market includes cloud-based solutions and on-premise solutions. In 2016, the cloud-based segment commanded the largest share of the global ambulatory EHR market. The market is mainly driven by the advantages associated with cloud-based solutions, which include flexibility and cost reduction in healthcare delivery. On the basis of practice size, the global market has been segmented into large practices, small-to-medium-sized practices, and solo practices. The large practices segment commanded the largest share of the global ambulatory EHR market in 2016, owing to factors such as the availability of capital investments, ability to handle the productivity challenges that are created by new EHR adoption, and ability to choose among vendors. The end user segment of the ambulatory EHR market includes hospital-owned ambulatory centers and independent centers. The hospital-owned ambulatory centers segment commanded the largest share of the global ambulatory EHR market in 2016. On the basis of region, the market is segmented into North America, Europe, Asia-Pacific, and RoW. The North American region accounted for the largest share of the market in 2016. Growth in the North American ambulatory EHR market can be attributed to factors such as federal mandates, increasing geriatric population, collaboration between stakeholders, the need to curtail healthcare costs, payment deductions driving the adoption of EHR, conferences and workshops to raise awareness in the U.S., growing efforts to enhance healthcare delivery, and the adoption of digital recordkeeping in Canada. The major market players in the ambulatory EHR market include Cerner Corporation (U.S.), McKesson Corporation (U.S.), Allscripts Healthcare Solutions, Inc. (U.S.), Epic Systems Corporation (U.S.), eClinicalWorks (U.S.), athenahealth, Inc. (U.S.), NextGen Healthcare Information Systems, LLC (U.S.), eMDs, Inc. (U.S.), Practice Fusion, Inc. (U.S.), Amazing Charts, LLC (U.S.), GE Healthcare (U.S.), and Greenway Health, LLC (U.S.). 10.2.1.1 Federal Mandates In the U.S.
10.2.1.4 Need to Curtail Escalating Healthcare Costs In the U.S.
10.2.1.5 Payment Deductions Driving the Adoption of EHR In the U.S.
10.3.1.2 Government Focus On Integrating HCIT Solutions In the U.K.
Table 54 Recent Events Related to Ambulatory EHR In the U.S.